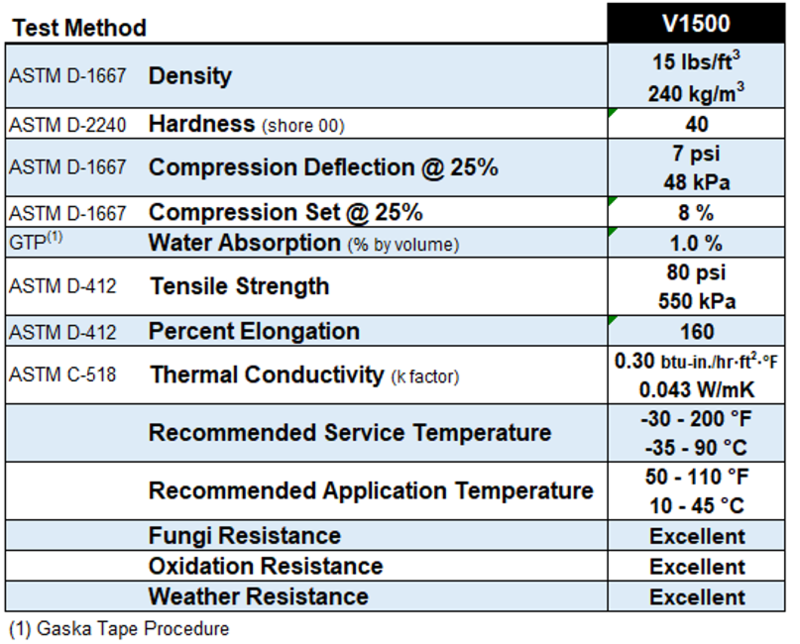 V1500 Series – Gaska Tape Inc.
Gaska Tape’s V1500 Series product is a medium density closed-cell Polyvinyl Chloride foam. The tape provides an excellent combination of flexibility and conformability with strength and wear resistance. Performs in those “tough duty” applications where a tape must still flex to fit and seal. Excellent dimensional stability and cushion against heavy loads. V1510 is cast on a 5 mil 83# supercalendered kraft paper. V1515 is cast on a 2 mil polyester film to provide dimensional stability, and is a self-wound product. “Swirl-Free” foam that won’t move, twist or displace when penetrated by mechanical fasteners. V1500 foam density permits clean die cuts and ease of penetration by fasteners.